Acrobat PDF files and documents can be protected and encrypted with password to deny unauthorized access and reading, especially sensitive private information. However, the password protection can sometimes lock out owner yourself, the legitimate author or its intended recipients from opening the PDF files, if you lost or forget the password required to open the document. There are plenty of commercial PDF password recovery software available which must be purchased with cold hard cash to unlock or crack a password locked PDF document. You would probably ask if the open source community is so lousy with no PDF password recovery and cracking utility been developed. Well, don’t worry. 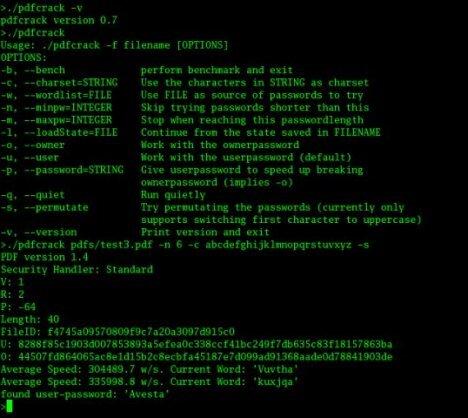 There is indeed PDF Crack, a command line user password recovery tool for PDF files. PDFCrack is a GNU/Linux open source (GPL) PDF password cracker for recovering passwords and content from PDF files which have been locked and protected with lost or forgotten password. PDFCrack is command line driven without any external dependencies, and use guessing or password cracking method of dictionary attack and brute force attack. PDF Crack supports and works on Linux and other POSIX-compatible systems, and a Windows binary version has also been ported and compiled with Cygwin, a Linux-like environment for Windows but Windows binaries are no longer available by default. To run pdfcrack in Windows, you have to compile the source code with Cygwin, a Linux-like environment for Windows. Replace locked.pdf with the actual filename for the protected PDF files which you have forgot the password. To speed up the cracking process, specific minimum (-n) and maximum (-m) length for possible password, and specify the possible characters (-c) to brute force the password. PDFCrack version 1.1 is the latest version that has been ported to Win32 platform, and has been tested to work PDF version 1.6 from Adobe Acrobat version 7.0 with AES encryption support. For Linux users, download the PDFCrack source code from SourceForge.net, and build the program manually.